Chicken pot pie? In this weather? I know I complain about how hot it is, cry for no cook dishes that won’t heat up the house, and then keep giving you baking recipes. And here, after cauliflower mac and cheese, lemon poppy seed muffins, and fig and brie-stuffed chicken I’m giving you the fourth recipe in a row that requires turning on an oven. I do apologize. But if you’re thinking of the heavy, cream-filled chicken pot pies of your childhood (or Paula Dean’s restaurants), this is not it. Comfort food, yes, but a lighter, more sophisticated rendition. I’ve had my eye on this recipe for some time now. It’s another Mark Bittman creation (can I start getting royalties yet?) and although I changed nearly everything about the recipe, it was his inspiration that got me going. “The idea here,” he explains in his now retired Minimalist column, “is to do much of the cooking in one pot and skip the most finicky part, the crust, in favor of a simple biscuit topping.” So there’s less bready, carby crust and more delicious, chicken and vegetable-packed filling. The other cue I took from Bittman was to use corn starch to thicken things at the end instead of a roux. A quick fix, perhaps, but I don’t think anyone would be able to tell the difference. This is a great job for a rotisserie chicken, bringing this dish into the realm of weeknight cooking. And while Bittman makes a simple and delicious-sounding buttermilk biscuit topping, I used my old standby, frozen puff pastry. The filling is hearty, but not heavy. In fact, all things considered, this is a fairly healthy dish. If you like a creamier, more decadent pot pie (also very good) then I would suggest adding cream towards the end to thicken things up. And I find that the presentation of individual pot pies is a little more elegant, suitable for entertaining or just fun to have your own little package of food. You can easily make this in one baking dish, however, just lay some of the puff pastry on the bottom and top with the same amount of rounds. Or, for a more traditional preparation, bake it into a covered pie crust. Heat oven to 400F. Put oil in a large skillet over medium heat. Add the onion, celery, red pepper, and garlic and cook, stirring occasionally, until softened. Season with salt and pepper. Add the mushrooms and cook until liquid has released and evaporated, 8 to 10 minutes. Add the stock, wine and thyme and bring to a boil for a minute or two. Add the carrots and reduce the heat to bring to a simmer. Cook until the carrots are almost tender, 8 minutes. Add the chicken and peas and cook for another minute or so. Add the corn starch and stir to combine thoroughly. Fish out the thyme stems and discard. Remove skillet from the heat and set aside. Roll out the puff pastry on a lightly floured surface or non-stick surface. Using a cookie or biscuit cutter, make 12 circles slightly smaller than the ramekins. Put one in the bottom of each of six ramekins and bake for 10 minutes, or until lightly browned and puffed up. Remove from the oven and poke to deflate. Divide the chicken and vegetable filling between the six ramekins and top each with one of the remaining six pastry rounds. Bake for 20 minutes, or until filling is slightly bubbly and puff pastry on top is nicely browned. Remove from the oven and allow to cool 5 to 10 minutes before serving. Ooo these look so good! I love the presentation too! Beautiful! These look so delicious and I love your photos :o) And thanks for accepting my friend request on Foodbuzz! I never tried making chicken pot pies, but I just bought small ramequins… I think this might be a great way of doing two things for the first time! Just saw foodbuzz and congrats on top 9!!! Wow these pot pies look delicious! 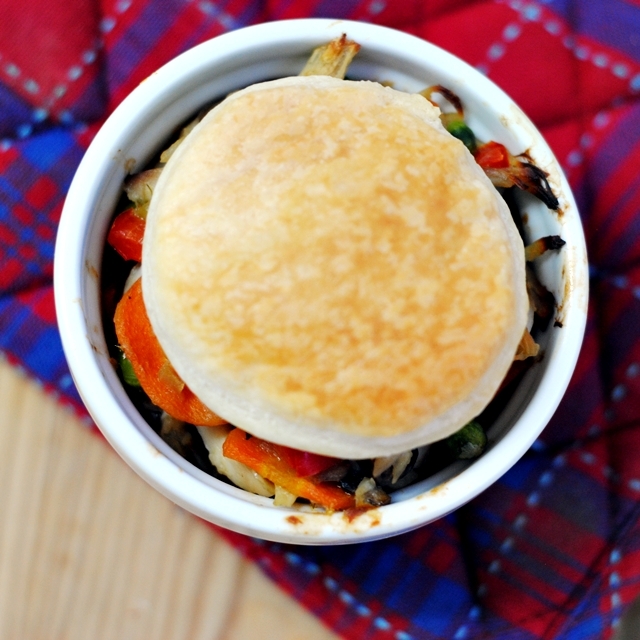 I have never made chicken pot pies and this is a great recipe for family gathering with kids!! I have those ramekins for makinig creme caramel (only) but now I have another way to use it! Bookmarked the recipe. Thanks! @Rosemary, @Beth, and @Kay – thank you so much! @Nami – Oh wow, I hadn’t seen that yet, thanks so much 😀 These are definitely family friendly! I hope your kids like it. Totally agree – I’ve been using puff pastry for everything lately! Thanks so much, both on the congrats and bday wishes. So sweet. What size ramekins did you use for this recipe? I didn’t realize how many different sizes they came in. Great question. I don’t know exactly but I believe they are 6-ounce ones (I’d say they are about 3 inches wide and 2 inches deep, but that’s just an estimate as I can’t find my ruler). Since this recipe isn’t dessert baking (like for a souffle) you have a lot of flexibility in what size ramekin you use. These look totally yummy. 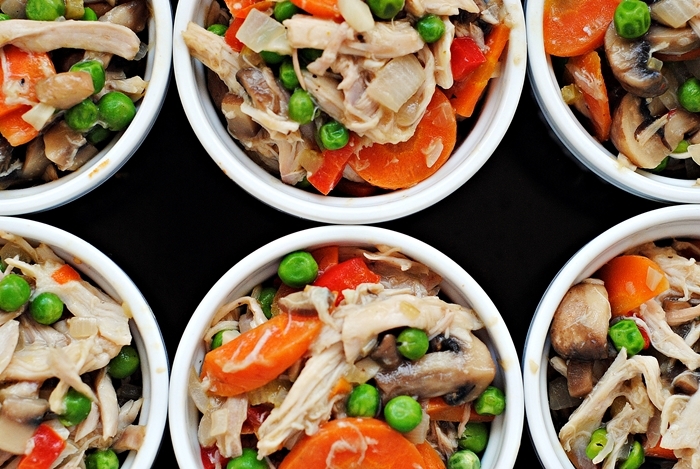 Chicken pot pies are one of my favorites and my husband always thinks they are too unhealthy. This will be a perfect compromise! Thanks! I think this is a good compromise too 🙂 I hope you enjoy! !